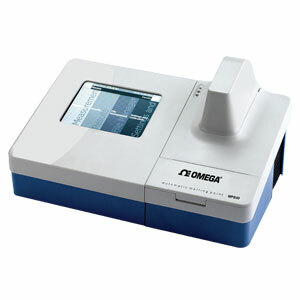 The MPS40 automatic melting point uses the latest technology in digital image processing, to accurately identify the melt of up to 3 samples simultaneously. The unit comes with a 145 mm (5.7") color VGA display, on which the melt can be watched real time, or the melt video will automatically be saved as an AVI file that can be reviewed later, either on the unit or via PC, providing traceability long after the sample has gone. The result can also be overridden if for any reason you don’t agree with the result calculated by the image processing algorithm. The MPS40 is fully programmable via the touch screen display, once the user has set the plateau temperature they can select the ramp rate, between 0.1 and 10°C (0.2 to 18°F) in 0.1°C (0.2°F) increments. During use a library of preset methods can be built up to streamline the method input for repeat measurements. For materials where the user is unaware of an approximate melting point, and therefore unable to set the plateau temperature, the MPS40 can be used in rapid melt mode. During rapid melt mode a fast scan of the full temperature range is undertaken to provide an approximate melt temperature, then a method will be automatically programmed with the appropriate plateau temperature to allow a more accurate measurement to be carried out. The MPS40 has an innovative split design concept, the unit can be used as normal or the control side and the melt side can be separated, allowing for the maximum in footprint flexibility. After the samples have been loaded the melt side of the unit can be placed at the back of the bench or even in a fume cupboard to catch any potentially dangerous fumes. Once the unit has been split the control panel side can be used in two orientations, either landscape or portrait to allow the perfect viewing angle whether you are sat or stood at the bench, the screen automatically changes orientation with the unit. The unit can store up to 200 result files with videos, if required data can be easily transferred from the unit to a flash memory drive or PC via one of the USB connectors. The unit has been designed to include a number of other useful features such as slots to accommodate pre-prepared samples and a draw to house your unused melting point tubes. Also included in the draw is a handy glass cutter, which can be used to accurately cut tubes in half quickly and cleanly for users who prefer to use half tubes. All units are supplied with a NIST calibration certificate showing individual serial numbers. Nota: Comes complete with 100 melting point tubes, RS232 cable, USB cable, UK, European and USA power cords, NIST calibration certificate and operator’s manual.